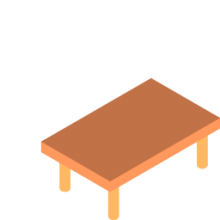 From coffee tables and dining tables to kitchen tables and more, there is a lot of variety to take your pick from when it comes to selecting tables for your home. However, compared to the time invested while selecting metal or wooden table bases, most of us don’t give much of a thought to buying matching table legs. Yet, when you have crafted a DIY table base, or have a modern one, or a traditional piece, finding the most suitable table legs is of utmost importance to make the entire structure eye-catching and sturdy. Thanks to their sturdiness, variety in size, and style quotient, metal table legs are in high demand these days (Source). Whether you need the standard varieties for your end tables, coffee tables, console tables, dining room tables, farmhouse tables, or kitchen tables, you will have an extensive range to choose from. Some manufacturers may even be ready to customize metal table legs to suit your preferences and your interior design. And the real beauty of these legs is that you can pair them with table bases made of either wood or steel or any other metal. In fact, the combination of metal and wood is so harmonious and well-balanced that you can successfully make it an integral part of any setting and style – from old-world to contemporary and even more. 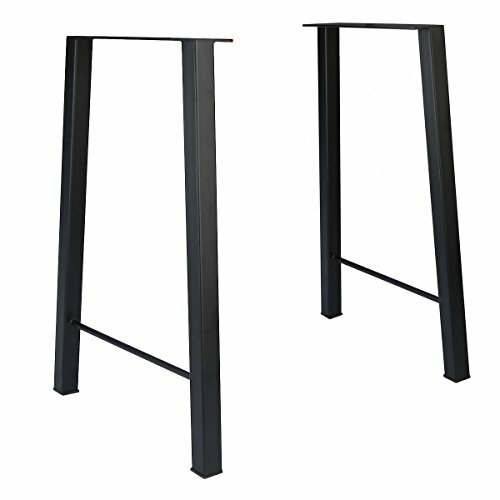 Type: From square legs and diamond-shaped legs to trapezium frames, x-shaped legs, tapered metal tip frames, curvy legs, hairpin legs, skateboard legs, and industrial legs, a lot of variety is available in the market when it comes to metal table legs. Style: Depending on what suits your table base the best and even matches your interior décor, you can decide which type of legs you want to opt for. Expense: Cost is another factor you should consider. Depending upon the quality of material used, the weight the legs can support, their design (which could be anything from mid-century and vintage to contemporary, funky etc), and professional finish, the cost would differ. Extra Features: The legs that come with additional features like caster floor protectors, or the ones that are custom-built to your specifications tend to have a steeper price tag than their standard counterparts. Make sure to have a clear idea of what you need or prefer to have, in addition to setting up a budget before you go searching for metal table legs. 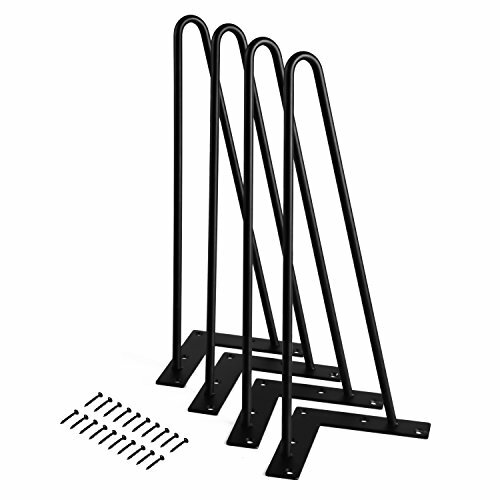 Metal table legs form the structure that supports your table base. Since most of these legs come with their screws and fixtures, and don’t need any welding, DIY enthusiasts can now find it easy to make their own tables. For instance, you can pair an old table top with industrial modern legs to get a super stylish piece of furniture that can find a place of pride in your dining room. You may even buy a small corner table top with hairpin legs that would jazz up your space. 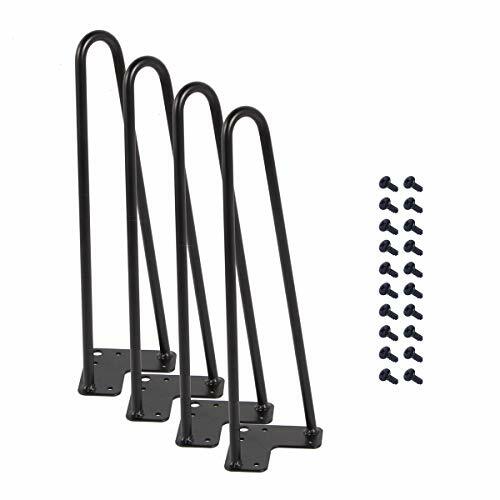 Since metal hairpin table legs can work with a wide variety of table tops or cabinets and are easy to attach, you may even buy some from stores or online marketplaces to use in your DIY projects. 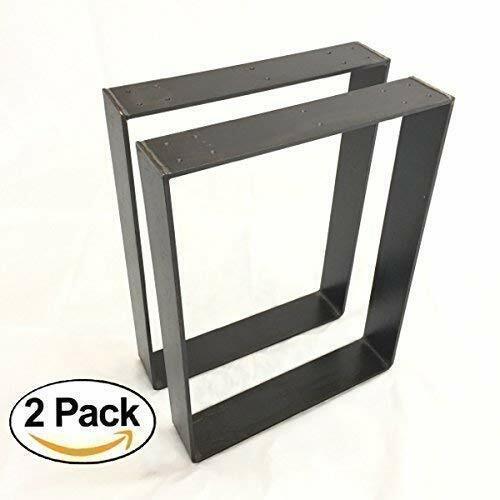 From aluminum cone legs, 1 X 1 and 1 x 2 tube legs, to four quarter legs, flat bar legs, X-tube legs, tripod stands, trapezium bench legs and more, both physical stores and online marketplaces offer a lot of variety in terms of what you can get while shopping for metal table legs. At first, raw metal is cut to length. Next, the parts are cleaned, after which they are welded together to the dimensions and shape specified. Then the welds are ground down carefully to form a seamless appearance, which is followed by the legs being cleaned and painted. 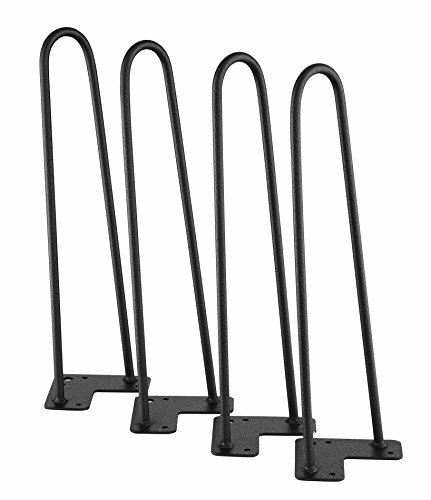 A wide variety of different tubing sizes are used to craft metal table legs based on how bulky you want your base to look. Some people believe that larger tubing sizes give their table more stability and strength. While this is true to some extent, it doesn’t mean thin legs (say, hairpin legs) are unstable or not adequately sturdy. Since products from reliable manufacturers are usually made of high-quality metals, and undergo extensive quality control check, you can be assured of getting stable, stylish, and strong metal table legs irrespective of the type and size you select. Raw steel: This is 100% bare and natural steel, which is ideal if you are a DIY enthusiast who wants to finish coating the legs on your own. Remember that unless you give it a protective coating, it can rust, even when you position it indoors. Copper: If you are looking for table legs to suit your contemporary aesthetics, the ones made from real copper would be your best bet. Over time, they will age and showcase a stunning glaze. Silver: By electro-treating steel with zinc, such legs provide you with an extremely strong, rust-proof finish. You can use these metal table legs even in the outdoors. Clear powder coat: If you are aiming to get a raw steel, industrial kind of look, get one with clear powder coat that gives the metal a slight sheen and seals the steel to give you durable, rust-free table legs. Color powder coat: If you want a pop of color in your table legs, the ones with color powder coat (available in varied colors – from white and black to other vibrant colors) should be on your shopping list. Chrome: If your tabletop is dark colored, you can buy chrome legs, which are polished to give you a mirror finish, for a striking look. If you thought metal table legs are suitable just for home use, think again. Be it modern office furniture – from computer desks, L-shaped office table, stand up desks, and executive office desks, to school furniture such as reading tables with metal legs, you will find metal table legs in use at various settings. Tables with such legs can be wonderful additions to both indoor spaces as well as the outdoors. Whether you have casual living rooms, office cubicles with space constraint or open floor plans, a landscaped garden in your backyard, or a bachelor pad, addition of a table with metal table legs could give the space an interesting form and style quotient. With so many choices out in front of you, whether from Etsy, Ikea, Lowes, or Home Depot, deciding what you want could be a difficult task. Still, it all boils down to your personal taste, budget, and your interior décor. We’ve seen some people who were using a milk crate before buying some of these legs to fix their broken dinner table! For instance, a pretty basic and mainstream design could be where you get a combination of solid wood top with graphical metal bases to display a simple, yet pleasant contrast. Again, you may enjoy the sophisticated craftsmanship where contrasting elements are blended to create a mesmerizing effect like when you have a simple marble top placed over a sculptural metal base. Thus, what you would select finally is just a matter of making an informed choice after considering what your needs and preferences are.